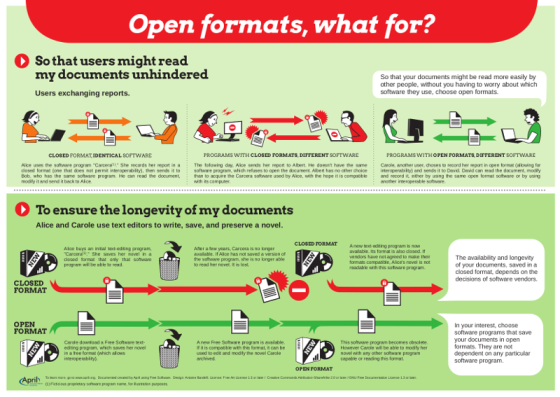 To celebrate Document Freedom Day April has published a poster to explain to software users how opting for "open formats" to exchange and store their files in their interest. What does "open formats" stand for? What makes using this type of formats different from using closed formats when exchanging or storing files? 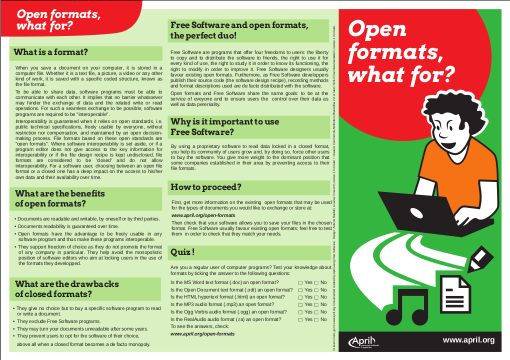 The following poster and flyer show two basic scenarios explaining the "open" and "closed" formats concepts. When you save a document on your computer, it is stored in a computer file. Whether it is a text file, a picture, a video, or any other kind of work, it is stored with a specific coded structure, known as the file format. To be able to share data, software programs must be able to communicate with each other. It implies that no barrier whatsoever hinders the exchange of data and the related write or read operations. For such a seamless exchange to be possible, software programs are required to be "interoperable". Interoperability is guaranteed when it relies on open standards, i.e. public technical specifications, freely usable by everyone, without restriction or compensation, and maintained by an open decision-making process. File formats based on these open standards are "open formats". Where software interoperability is set aside, or if a program editor does not give access to the key information for interoperability, or if the file design recipe is kept undisclosed, file formats are considered to be 'closed' and do not allow interoperability. For a software user, choosing between an open file format and a closed one has a deep impact on the access to his/her own data and their availability over time. What are the benefits of open formats? Documents are readable and writable, by oneself or by third parties. Documents readability is guaranteed over time. Open formats have the advantage of being freely usable in any software program and thus make these programs interoperable. They support freedom of choice as they do not promote the format of any company in particular. They help avoid the monopolistic position of software editors who aim at locking users into the use of the formats they developped. What are the drawbacks of closed formats? They give no choice but to buy a specific software program to read or write a document. They exclude Free Software programs. They may make your documents unreadable after some years. They prevent users from opting for the software of their choice, above all when a closed format becomes a de facto monopoly. Free Software and open formats, the perfect duo! Free Software programs are programs that offer four freedoms to users: the liberty to copy and to distribute the software to friends, the right to use it for every kind of use, the right to study it in order to know it works, the right to modify it in order to improve it. Free Software designers usually favour existing open formats. Furthemore, as Free Software developers publish their source code (the software design recipe), the recording methods and format descriptions used are de facto distributed with the software. Open formats and Free Software share the same goals: to be at the service of everyone and to ensure users the control over their data as well as data durability. Why is it important to use Free Software? By using a proprietary software to read data locked in a closed format, you help its community of users grow and, by doing so, force other users to buy the software. You give more weight to the dominant position that some companies established in their area by preventing access to their file formats. First, get more information on the existing open formats that may be used for the type of documents you would like to exchange or store, at: www.april.org/formats-ouverts or at wiki.april.org/w/FormatsOuverts. Then check that your software allows you to save your files in the chosen format. Free Software usually favour existing open formats; feel free to test them in order to check that they match your needs. Document designed by April with Free Software. Graphics: Antoine Bardelli. Free Art License 1.3 or higher / Creative Commons Paternity, Share alike 2.0 or higher / GFDL 1.3 or higher.